The March 2013 issue of Food and Wine Magazine had a great article called 20 Best-Ever Recipes. 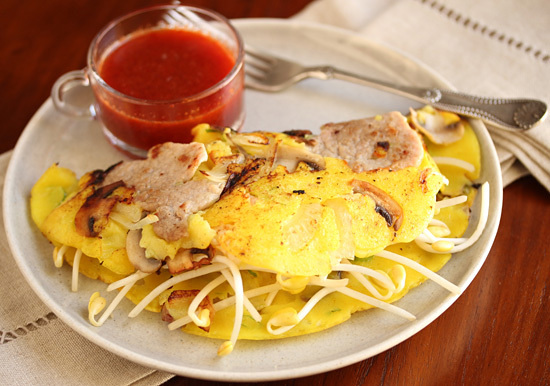 The Best Vietnamese recipe was this one for Happy Pancakes and I wanted to cook it immediately as soon as I saw it. 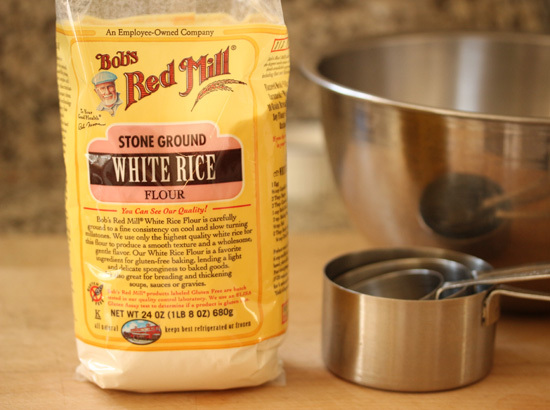 Two months later, at Camp Blogaway, I was lucky to get a sample of Bob’s Red Mill White Rice Flour and as soon as I got home I started to gather my ingredients to make Happy Pancakes. I have never used rice flour before, so I was excited to see what these pancakes would be like. I was happily surprised at their chewy goodness. I must say, these pancakes are probably the homeliest thing I have cooked in a long time, but this dish is the best thing I have eaten in a year, at least. The dipping sauce stopped me in my tracks and made my eyes blink rapidly. OMG. The combination of spicy chile, garlic, sugar, lime juice and fish sauce is just killer. Make the dipping sauce, even if you don’t make the pancakes. Find something to put it on. You can thank me later. The dipping sauce starts off with the chilis, garlic and sugar in the mortar. 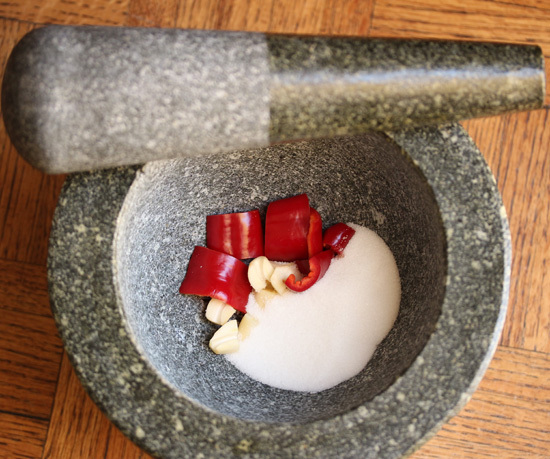 I have this granite Thai mortar that weighs 18 pounds. It makes me chuckle every time I heave it onto my kitchen counter. Whoever thought up the design for it was a genius, because the shape of the bowl is perfect and nothing ever slops over the top rim. The chili, garlic and sugar are pounded to start breaking them down and to melt the sugar. 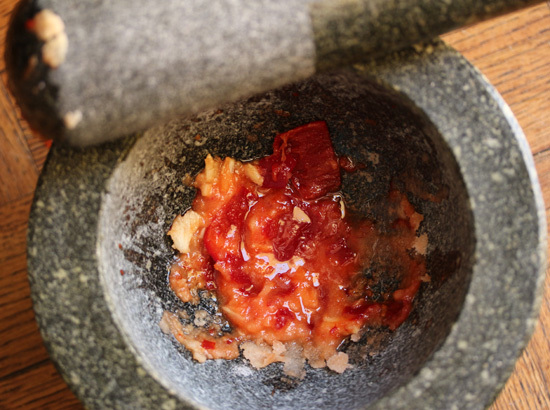 After pounding, the chilis are rubbed round and round with the pestle until a paste forms. Next lime juice and fish sauce are added to the chili mixture to finish the dipping sauce. I made the pancakes with Bob’s Red Mill White Rice Flour which makes an interesting sort of gritty batter, to which turmeric and sliced green onions are added. The turmeric makes the batter bright yellow. Shrimp, pork loin, mushrooms and onions are sautéed in the pan before the pancake batter is poured over. The recipe calls for 10 mushrooms and ½ an onion sliced, but you may need more, depending on how many you add to each pancake. My first pancake was not very photogenic and I had no idea what any of this tasted like. I was afraid I was creating a monster. This pancake really was not pretty. But the first bite made me swoon. Really. 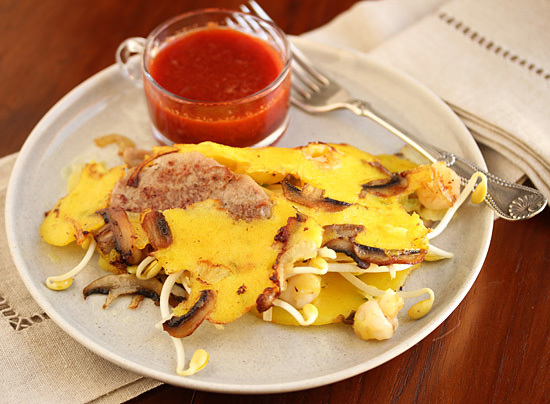 The chewy pancake with the carmelized pork, onions and mushrooms and the crunch of the bean sprouts with the zing of the spicy salty garlic-y sweet dipping sauce. Oh man… perfect. Sublime. My second pancake turned out much better. I had a better idea how much of the batter to pour over, and how much of the onions and mushrooms I needed. I made the rest of the batter into pancakes and set them out on the counter to cool. I wrapped them in plastic wrap, paper plates and all, and in a ziptop bag to be eaten at a later date. I love the idea that I have some of these in the freezer, just waiting to indulge me. Now I know why they call them Happy Pancakes. 1. Make the dipping sauce. 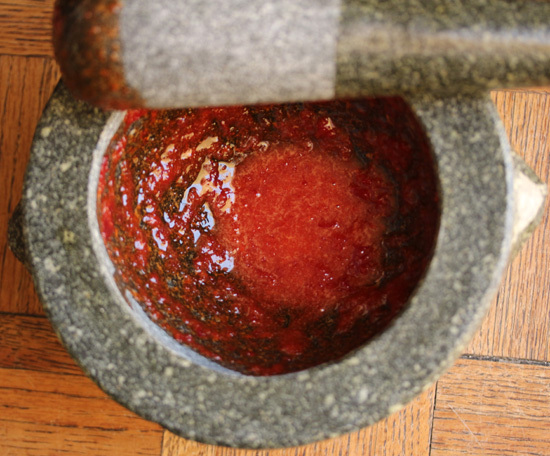 In a mortar, pound chiles, garlic and sugar to a paste. Stir in the fish sauce, lime juice and water. 2. Make the pancakes. 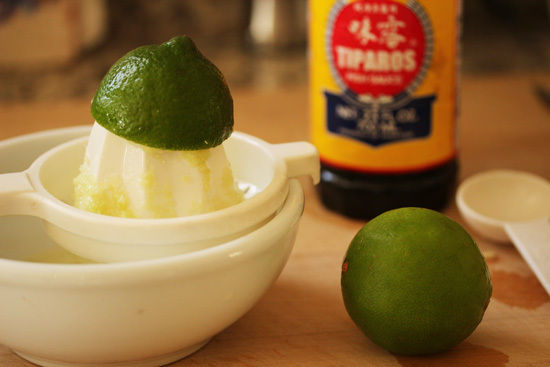 In a bowl, whisk together rice flour and 2 cups of cold water. Mix in turmeric and sliced green onions. 3. 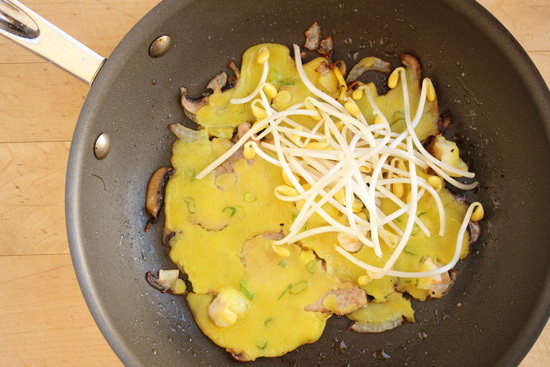 In a large non-stick skillet, heat 1 tablespoon vegetable oil over medium high heat. 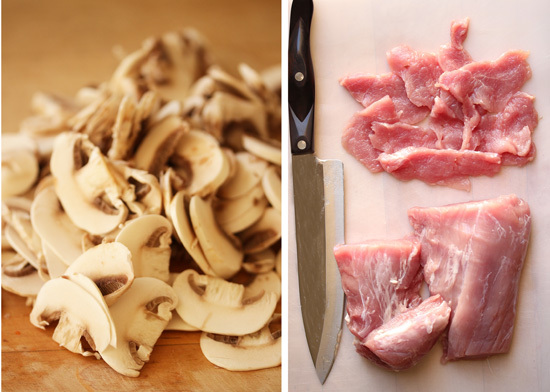 Add 3 slices of pork, 3 shrimp and some slices of onion and mushroom. Season with 1/8 teaspoon each salt and pepper. 4. When pork is starting to brown, turn it over to sear other side. 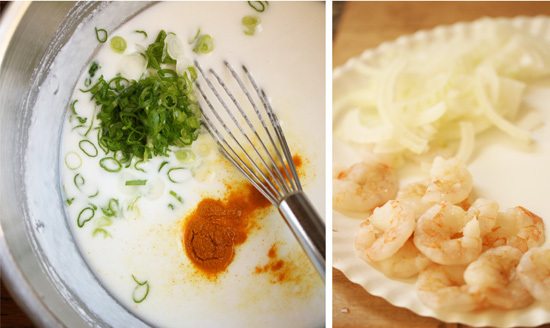 Turn shrimp over and cook for 1 minute. 5. Stir the rice flour batter again and ladle 1/3 cup over and around pork in pan. Tilt pan to distribute evenly. If there are holes in batter, fill in with a little more. Cover, lower heat to medium and cook until sides of pancake are brown and start to curl up, about 2 minutes. 6. 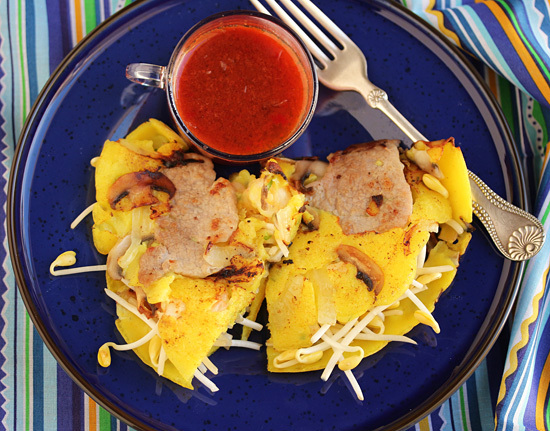 Scatter a small handful of bean sprouts over pancake and fold in half. Slide onto warm platter and keep warm in low oven. Repeat with rest of ingredients. Serve warm with dipping sauce on the side. I applaud you for taking on that challenge. It looks like it was well worth the effort! I have not seen red jalapenos, where did you get them? Thanks for the blow-by-blow account of their photogenic-ness. Maybe next time you can skip the first few steps and go straight for the beauty shot. 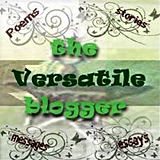 I love all the pictures. I feel like I was standing right beside you being happy as you made these Happy Pancakes. Did I miss a picture? There is a space above the Bob’s Red mill paragraph. 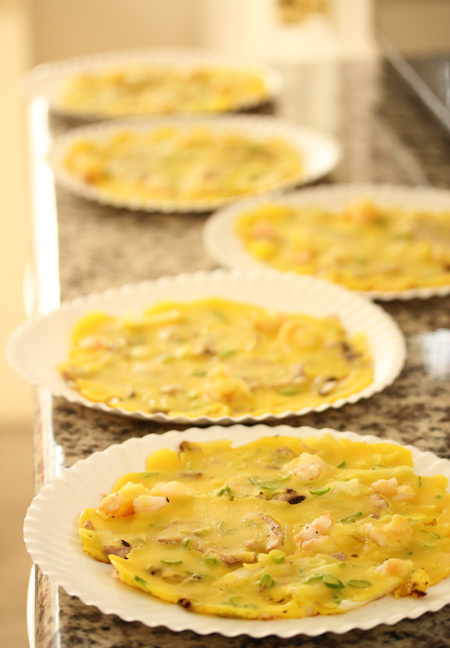 Wow, totally thought these were omelettes, haha. 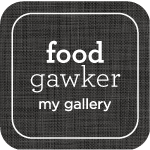 The flavors sound intense and amazing! I love the idea of freezing them on plates for later. 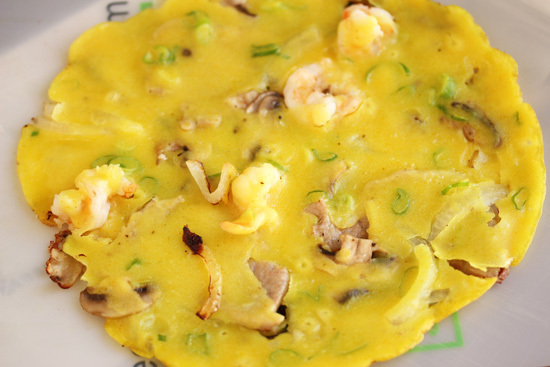 I’ve never really used rice flour, the flavor combo sounds divine!